Two of the Nationalist leaders, Malik-Mutikalamin and Mannchir Khan, were hanged in the Royal camp to-day. Anxiety is felt regarding the fate of the others, including the President, notwithstanding the verbal promise of the Shah to spare their lives. The house of Zahir-ed-Dowleh, now Governor of Resht, has been bombarded and looted. A state of terrorism exists. Troops are guarding the approaches to the British Legation, with orders to shoot fugitives seeking sanctuary there. On this date, two Persian constitionalist liberals were summarily hanged by the Shah as two factions fought for the future of Iran. On June 23, the Shah’s Cossacks — he had Russian support, arranged with the connivance of other European powers — bombarded Iran’s parliament, capturing in the process a number of constitutional delegates. Two in particular, both of them prominent Azali Bab’i exponents of the constitution, would interest the Shah. Mirza Jahangir Khan (left), and Malek al-Motakallemin. 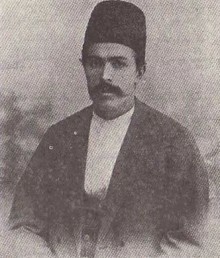 Journalist, revolutionary, and intellectual Mirza Jahangir Khan Shirazi was a well-known spokesperson of the reformist cause through his paper Sur-e Esrafil. 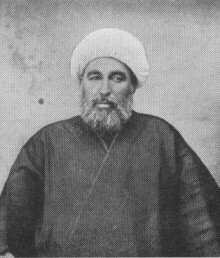 Malek al-Motakallemin was a dissident essayist and preacher with an interest in Persia’s Zoroastrian ancient history. Their hanging this day calmed the capital for the moment, but hardly settled matters in Iran. (Indeed, one could say matters have never been settled in Iran.) By the next year, Mohammad Ali Shah Qajar was out on his ear (he’d die in exile) — succeeded by the last monarch of the Qajar dynasty.